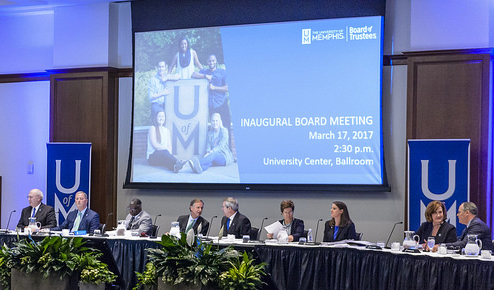 The Focus on College and University Success (FOCUS) legislation supported by Governor Haslam and passed by the Tennessee General Assembly in spring 2016 allowed for the establishment of an independent governing board at the University of Memphis and other public universities across the state. Our inaugural Board of Trustees (BOT) met for the first time on Friday, March 17, 2017. The UofM welcomes the autonomy that the FOCUS Act provides the University of Memphis. In the coming months, a host of issues will be reviewed with the Board of Trustees as a prelude to launching a new strategic planning effort in late summer or early fall. Independent governance presents an opportunity for our campus to invest in greater depth and detail in our future. As we transition, we will continue to focus on the reasons we are here – student success, knowledge creation, research innovation and community service. We are grateful to Governor Haslam for choosing these very talented leaders to serve on our board. Detailed information about our Trustees can be found at memphis.edu/bot/board/.